You’ve been collecting for ten years or twenty years or thirty years when you are faced with a change in lifestyle: retirement, moving to a new location, a grandchild starting college or just a change in taste. Naturally, this change will impact your doll collection. If you haven’t been refining your doll collection all along, it has probably become an accumulation of dolls and accessories in need of weeding out. You have decisions to make. In order to accomplish this, you have to be willing to set aside sentiments, admit to yourself that you paid too much for some of the dolls, recognize which of the dolls have been a good investment, identify the dolls that you are ready to move along and importantly, understand how doll price guides work. The first thing most collectors do when they decide to sell a doll, is grab their Blue Book off the shelf. They do not read the preface that explains the prices in the book are strictly guidelines based on data compiled from documented transactions. When you are selling locally, those prices may have little relevance. There are many possible avenues to take to begin to refine your doll collection. The first step involves little more than housekeeping. (If you have been refining your doll collection all along, skip to step two!) Separate the dolls and accessories you are willing to part with at the present time. If you have never done this before, this is the most difficult step. If the dolls are bisque or china, wash their faces and have a good look at the heads to ascertain the condition. Do not be distressed if you find a hairline on a doll you bought twenty-five years ago! You can probably still sell it for more than what you paid originally. Admit to yourself that you may have made some hasty decisions or beginner’s mistakes. Now is the time to get them out of your collection. By the time you complete the first step, you will probably have a group of dolls to go to a dealer, a selection of highchairs, carriages and doll beds to go to a local auction house and a box of STUFF. If the box of STUFF is clean and you just know someone will love it, think about donating it to a local charity or putting it on your club sales table. On the other hand, if the box of STUFF is too embarrassing to attach your name to, throw it in the trash! It is never a good idea to offer dolls or valuable doll related items on your club sales table. Your club members will be offended that you are asking full price and you will be offended that they don’t want to pay it. Doll carriages and furniture is easiest to sell through an auction company in your own area. Of course, you will have to pay sales commission, but you will not have the work and worry of carrying the items around to shows and trying to sell them yourself. 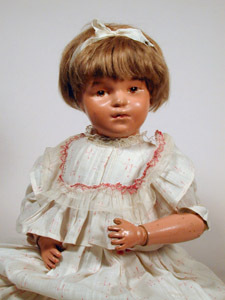 Since you are reading Antique & Collectibles Trader, we’ll assume you are selling mainly antique dolls. 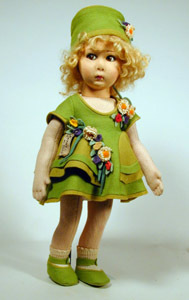 If you are selling German dolly-faced dolls on leather bodies, baby dolls on cloth bodies, china dolls with plain centre-parts (so-called high-brow or flat-top), composition dolls that are not all original, plus a sprinkling of hard plastic or vinyl that is not mint-in-the-box, Cabbage Patch dolls and Holiday Barbies®, local dealers or auction houses may be interested. Before approaching a dealer or auction house, you should have a realistic figure in mind for the entire group and be prepared to negotiate. This is not the time to look back at your receipts from ten years past and assume you will get all your money back. The important thing to remember is that you are going to turn hasty decisions and beginner’s mistakes into cash that you will be able to get working for you again. If you have been refining your collection all along and you now have one good doll or a group of good dolls to sell, you have more options open to you. Perhaps you have a good rapport with a national dealer from whom you have purchased several dolls? That dealer will appreciate you thinking of them first. Again, you must have a realistic figure in mind and be prepared to negotiate. Study the ads in several magazines to see what prices are being asked for dolls like yours. Study the auction results from around the country to determine if now is the right time to sell a particular type of doll. If your doll is in excellent original condition, dressed appropriately, with shoes and with original wig, you should expect to sell it to a dealer for approximately 60-75% of retail. Do not be discouraged if the dealer you approach says they are not interested. They may be short of cash or just be overloaded with inventory at the moment. If a dealer offers you far below the price you want, take time to explore other options. As with all very specialized antiques and objects of art, you should find a person who specializes in dolls to help you appraise or sell the doll. Though experts on dolls are few and far between, many helpful experts can be found at the Toronto Doll Show. A nationally advertised doll auction house may be the most convenient way for you to sell your better dolls. The most credible doll and toy auction houses advertise in Antique Doll Collector magazine. The approximate 25% commission you pay the doll auction is good value when you consider that you did not have to pack the dolls, do the advertising, negotiate the sale or pack and ship dolls all over the world. Once you have refined your doll collection, you will no doubt begin rearranging the remaining dolls and feeling a greater sense of satisfaction with the quality of your collection. Now that you have sold the first few, you will understand that there is always another doll to buy and that it is highly unlikely that you will miss anything you have sold. In future, you will buy with a more educated eye. Always buy the best of what you can afford. 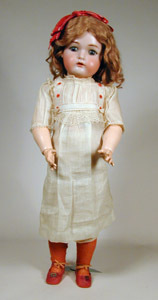 If you love German dolly-face girls, search for one in its factory original dress with its original mohair wig. If you are longing for a French fashion doll, think about the price range you can afford - there is a huge difference between leather bodies and articulated wood bodies. Then search for one in good condition with original or at least, antique clothing, shoes and wig. If you adore German characters, select one that has well defined modelling and fine painting. If it is a French bébé you’ve promised yourself, shop around! Not all Jumeaux, Steiners and Brus were created equal. Even those highly regarded companies reached a point in time when their product began to diminish in quality. Above all, never buy strictly for investment. Only buy a doll that speaks to you - one that makes you smile every time you see it. If you shop wisely, keeping in mind quality, condition and originality, your dolls will be an investment. Like any investment, the values escalate and diminish at different rates, according to the whims of collectors and the financial climate. In the current environment of financial uncertainty, political unrest and war-time angst there is a surplus of antique dolls for sale in North America. Prices on large French bébés have stabilized and even dropped. Dolls by Lenci, Käthe Kruse and American cloth dolls are available a lower prices than two years ago. German character dolls have held their price, but shown no noticeable increase. For the most part, SFBJ character dolls are a better buy now than they were ten years ago. 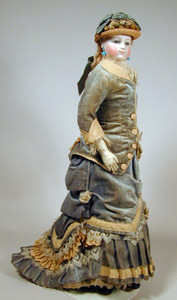 French fashion dolls with kid bodies are increasing in value, while Huret has stabilized and the very rare and expensive models such as Radiquet & Cordonnier and Dehors have actually come down in price. The American market for Bleuette has peaked and begun to wane, as the tremendous prices force more collectors to settle for one of the many fine reproductions being offered. Fine china dolls, mignonnettes and Simon& Halbig 900 series dolls are the popular sellers at the moment, increasing in price with every auction. Generally, doll prices in America are considerably lower than in Europe and the UK. Now is the time to put together any disposable income you can spare and buy dolls. It is a buyer’s market this year, a good time to weed out your collection and buy something you’ve been dreaming of. It is a very good time to get your collection working for you. 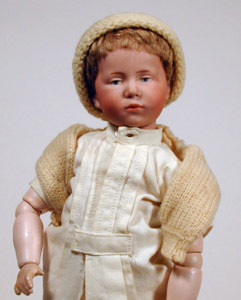 Lynn Murray has been collecting antique dolls since childhood. She now runs TLC Doll Shop at www.tlcdollshop.com and coordinates the annual Toronto Doll Show. This year the show is on Sunday, March 26 at the Thornhill Community Centre. See the display ad in this issue.